For a thousand years, a neverending war has been waged. Humans and drow elves are locked in a battle to hold the much coveted artifact, The Stick of Truth which has the power to control the universe. But the tides of war are soon to change as word of a new kid spreads throughout the land. This young hero will rise, destined to be South Park’s savior. From the creators of South Park, Trey Parker and Matt Stone, comes an epic quest to become… cool. Welcome to Supercheat's unofficial guide for South Park: The Stick of Truth. Please use the menu on the right to navigate. Help! Im on the spaceship and trying to defeat the last three aliens to free Randy but have no health packs left!! What do i do?!?! You want to shoot the broken TV to take out the first alien by the door. Then shoot the frayed wire to electrocute the second alien. This will leave only the third alien to battle. Also be sure to have a "shocking" patch equipped on whatever weapon you're using. The aliens are weak against Electricity. I hope this has helped. Good luck. Where do you find the alcohol to defeat the giant spider? help, im in the u store it facitliy (south park) and my little guy wont climb back up the ladder to get out...any suggestions? 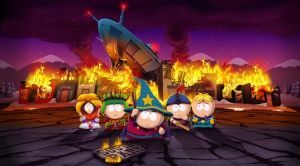 Is there really cheats for like money or immortality or other stuff for this game (South Park: The Stick Of Truth) ? No discussions open for South Park: The Stick of Truth at the moment.